Okayama University, situated near downtown Okayama City, is just two kilometers from Okayama Station, making it an easy commute. Despite being in the heart of the city, the sprawling campus, with its luscious greenery, has a quiet atmosphere conducive to study and research. Okayama Station is a key terminal drawing together the main railroads of western Japan. As a major transportation hub for the Chugoku and Shikoku areas, it is always bustling with people. Tokyo can be reached in three and a half hours, while Osaka are within an hour by Shinkansen. There is no direct flight service from Narita to Okayama. 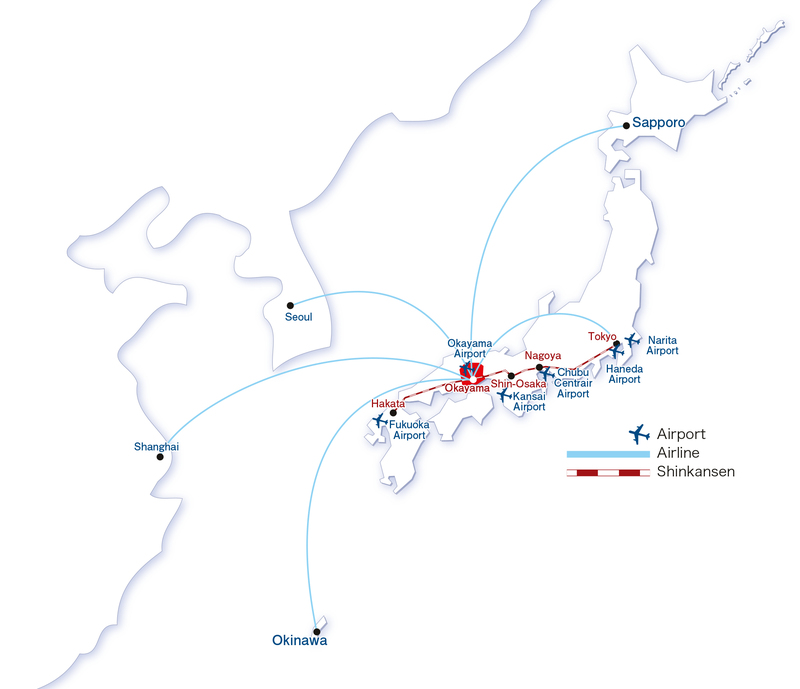 If you would like to take a domestic flight from Tokyo, you need to go to Haneda (Tokyo) Airport, which is an approximately 75-minute bus ride from Narita Airport (JPY3,100). The flight from Haneda to Okayama takes about 70 minutes. You can take the Narita Express from Narita airport to Tokyo station, which takes about 1 hour (JPY2,817). You can also take the limousine bus service, which can take up to 2 hours depending on the traffic (JPY3,100). There are frequent Shinkansen services to Okayama from Tokyo station, and it takes about 3 hours and 30 minutes by the super express “Nozomi”(JPY16,300). There is a direct limousine bus service to Okayama station, which takes about 3 hours and 30 minutes (JPY4,650). Please take the JR Haruka Express from Kansai airport to Shin-Osaka station (50 min). There are frequent Shinkansen services to Okayama station, which takes about 45 minutes by the super express “Nozomi” (for both Haruka and Nozomi:JPY7,180). 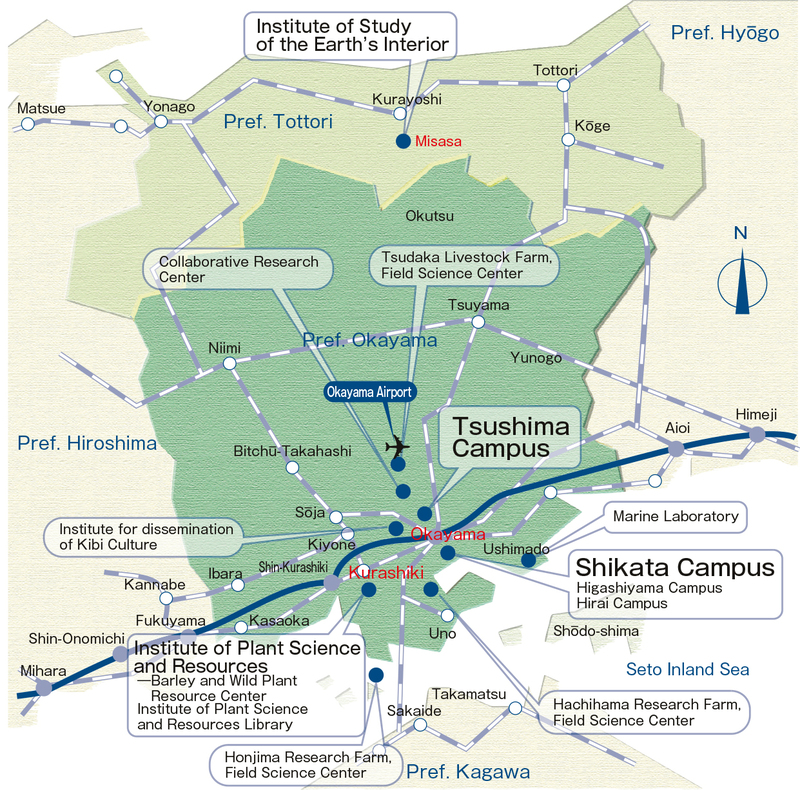 It costs approximately JPY5,000 from the airport to the Tsushima Campus. We recommend that you take a taxi from the station. There are several taxis waiting at both the east and west exits. The taxi fare to the Tsushima Campus is approximately JPY1,500. There are frequent bus services from Okayama station to both the Shikata and Tsushima campus. The bus fore is JPY 200 as of 2016.